This kind of thing makes better photographs from Top of the Rock etc. That tower looks so good to me. A mixed-use tower is planned by Tessler Development at 855 Sixth Avenue between 30th and 31st Streets. Costas Kondylis is the architect of the tower which will have more than 240,000 square feet of retail space, according to Benjamin Fox, the president of Winnick Realty Group, a leading specialist in retail real estate that is also handling the retail space at another major new mixed-use tower designed by Mr. Kondylis at 885 Sixth Avenue on the southeast corner at 32nd Street overlooking Greeley Square. The building at 855 Sixth Avenue, which also has the addresses of 101-113 West 30th Street and 106-8 West 31st Street, will have an unusual form with a setback tower rising from a low-rise retail base that cantilevers slightly on its south facade and has a setback on its east facade that also has a narrow northern section that angles outward and then inward. The Winnick Realty Group website indicates that the project would be finished in January 2010. The Department of Buildings issued a permit for a construction fence for the project November 15, 2007. It disapproved a new building permit for the project the same day and that plan called for a 30-story building with 197 apartments. The website for Pavarini McGovern, which shows the rendering at the right for the project, indicated today that the project would be 35 stories with 632,000 gross square feet and that the developer is seeking a silver LEED certification and that the building would have a garage and office space on floors 3 though 16. Tessler Developments' other projects include 260 Park Avenue South, 240 Park Avenue South, the Windsor Park on the southwest corner of Sixth Avenue and 58th Street, 150 Nassau Street, and 66 Leonard Street. It planned a mixed-use tower at 400 Fifth Avenue with Lehman Brothers Holdings on the northwest corner at 36th Street, but sold that property in August, 2006. Earlier this year, Joseph Chetrit had purchased this site from Baruch Singer for about $140 million, according to an article by John Koblin in the March 18, 2007 edition of The New York Observer. Mr. Fox told CityRealty.com today that both 855 and 885 Sixth Avenue are significant additions not only to the enormous retail presence at Herald Square anchored by Macy's but also to the impressive redevelopment of the city's former flower district on the Avenue of the Americas above 23rd Street with residential towers with large retail bases. The area to the west is in a very fluid state of flux with very ambitious plans for the former James Farley Post Office Building, the MTA's rail yards, the High Line elevated park, the Hudson Yards zoning district and an expansion/renovation of the Javits Convention Center. Winick Realty is also the leasing agent for Tessler Developments' mixed-use retail, office, and residential tower rising at 855 Sixth Ave. About 250,000 square feet of retail space will be located on eight floors: Five floors will be above grade and three below grade. A letter of intent has been issued to a high-end grocer for 60,000 to 80,000 square feet of below-grade space. This is certainly good Kondylis....is this his first experience with a major office/retail component? Three below grade floors dedicated to retail use? Since that won't count towards FAR, I guess that's the way to build in New York from now on: build downwards. That is, until the NIMBYs find some new reason to oppose that as well. What's going up directly across the street from this site? Are you talking about the big hole in the ground across 30th St. on the west side of Sixth? That would be the Fitzgerald hotel @ 835 Sixth Ave. whose thread is here. Nope I mean the building across 6th Avenue from 855. That would be a new one. There's no thread for it here yet. Which lots is that site made up of? Does it take up the entire block front from 30th to 31st? Derek had actually predicted this was going to happen awhile back although no one ever thought it would happen this quickly. It would be a shame to lose a couple of those taller buildings especially if the new tower is another boring glass box. Now that Sixth Ave's western wall of banality is nearly complete, expect proposals for the east side in the coming years. There are (at least) three big buildings going up on the west side of the street and (at least) one going up on the east side of the street. There goes (more of) the neighborhood. Skylimit, are you sure something's going to happen there. I checked the DOB and the only permits out are for façade repair. I must be mistaken, the all the projects in the area did have me confused for a while. There are one or two assemblages on the east side of the street, so that could be what you're referring to, but I don't think either project is ready to be permitted or ready to show any phyiscal signs of redevelopment. Rendering of a new tower planned for 885 Sixth Avenue, which is tentatively being called Tower 111. By this summer, the first residents of the long-awaited Chelsea Stratus will have moved into their condos in the neighborhood's tallest building. At 40 stories, the building's height has been its key selling point. In a few years, however, there will be more castles joining the Stratus in the sky along the heavily developed Sixth Avenue corridor between 23rd Street and Herald Square. One of the new towers in the pipeline for Sixth Avenue is 885 Sixth Avenue, which is tentatively being called Tower 111. The 47-story glass tower at 32nd Street will have 47,600 square feet of retail space, including a wide base for multi-level shopping. The ground floor, mezzanine, second and third floors of the Costas Kondylis-designed high-rise will house stores, while the upper levels will be residential — a design akin to that of the wildly successful Time Warner Center. The developer, Atlantic Realty Development, started consulting retail brokers when planning for the building commenced. Benjamin Fox, the president of the Winick Realty Group, is leading the leasing efforts for the project, and the firm expects it to draw national and international companies. The building will rise across the street from the Manhattan Mall and right near Macy's. Only a block away, Winick is also handling leasing for another tower that's in the works, 855 Sixth Avenue. Tessler Developments and the Chetrit Group are building a 30-story building that should be complete within the next couple of years. "The area is a continuation of Herald Square," said Jeff Winick, CEO of the company that bears his name. "J.C. Penney, for example, is coming to 32nd Street and Sixth." Winick said 855 Sixth, which is between 30th and 31st streets, will have anywhere from 120,000 to 200,000 square feet of retail space and two or three parking levels. Like 885 Sixth, the building is being designed by Costas Kondylis, and it too will have a wide base for stores topped with residential floors. "The area is a true melting pot of residential and retail," said Winick. "It's an obvious location to have big retail." And yet, developers are counting on the fact that plenty of people will want to call the stretch home. In this respect, the Chelsea Stratus, which is on Sixth Avenue between 24th and 25th streets, is a success story. "We're looking to have occupancy by the end of May or beginning of June," said Chris Saliearno, Prudential Douglas Elliman's on-site sales coordinator at the Stratus. Saliearno said that as of mid-March, 85 percent of the condo's 240 units were sold. Prices in the building started at around $750,000 and topped out above $4 million, with most in the $1 to $2 million range. "The ones on higher floors sold first," said Saliearno, who noted that the development attracted a wide range of buyers, including many first-time purchasers. 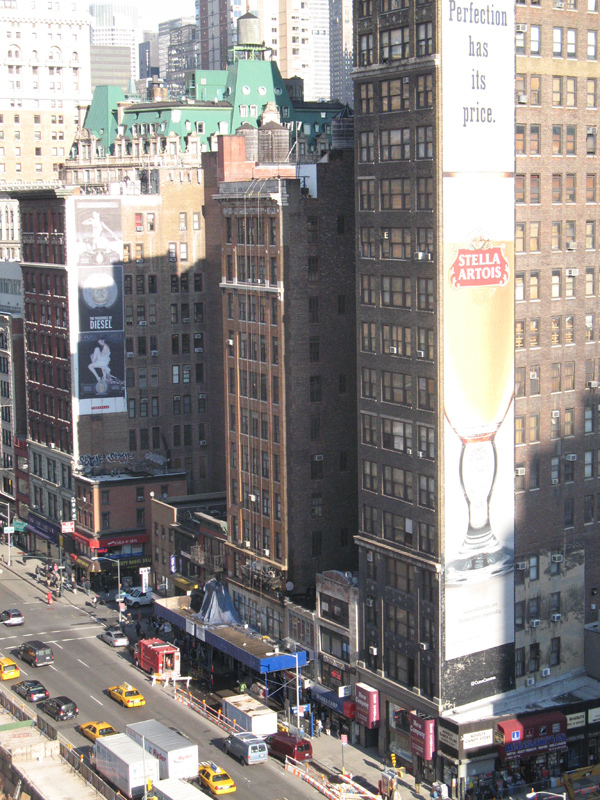 Until recently, new high-rise development on Sixth Avenue between 23rd and 34th had been primarily rental. Between 2000 and 2006, five rental buildings were constructed on the stretch, including the 407-unit Chelsea Landmark and the 266-unit Archstone Chelsea. Now, aside from the nearly complete Stratus and the developments at 855 and 885 Sixth, two other high-rise residential buildings are also on the drawing board: Adellco's the Remy, on 28th Street — which has been planned for a couple of years, though construction has yet to begin — and J.D. Carlisle Development's 46-story condo-hotel between 29th and 30th streets. There are also other hotels currently in some phase of construction nearby, including the Hotel Indigo at 127 West 28th Street, and 128 West 29th Street, which developer Sam Chang is turning into a Doubletree. As the Stratus bears out, sales in the area are generally healthy, according to brokers. "The studios, ones and twos are doing great," said Richard Hamilton, a senior vice president with Halstead Property. "There seems to be slowness in some of the loft-type buildings with full-floor units. The $2 to $4 million range is where we're seeing some resistance. The Stratus and the Onyx [at 261 West 28th Street] have both done well." Hamilton noted that the entire swath of the avenue is changing in character, especially in terms of its retail makeup. "You still see some of the storefront wholesalers, but they're on their way out," he said. "In 10 years, it'll look like a canyon filled with tall condos and rentals." Please chime in guys: A question of residential extremes.